The award winning Ballyliffin Townhouse is located on the Wild Atlantic Way & renowned for its relaxed and comfortable surroundings. Along with a warm & genuine hospitality, this family run premises is a landmark in the charming seaside village of Ballyliffin on the beautiful Inishowen Peninsula. The Ballyliffin TownHouse promises you that quiet relaxing break that you always dreamed about. Upon check-in, all guests are treated to complimentary Tea/Coffee and homemade cakes & breads, In fact for the remainder of your stay you can avail of the Tea & Coffee facilities. Their rooms boast Super King Size Beds & all the extras and more of any Four Star Hotel, with the added luxury of a full peaceful night’s sleep as at the Ballyliffin TownHouse, there is no functions or weddings. The North West Coast of Ireland provides some of the most exhilarating and challenging golf in the world and the Ballyliffin Townhouse is the perfect base to sample these golfing delights. 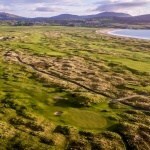 The Ballyliffin Golf Club is within 1km of the hotel and boasts two of the finest links courses (36 holes) in Ireland. The Old Links has been redesigned by Nick Faldo and is among the few elite courses that always make the ‘A’ list of discerning golfers from Europe and America. 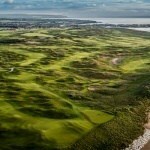 Whereas it’s other course, The Glashedy Links, has recently been announced as the venue for the 2018 DDF Irish Open. Ferry service provided between Inishowen and Northern Ireland leads you to the magnificent Castlerock Golf Club, Portstewart Golf Club and Royal Portrush Golf Club portrayed by many golfers as one of the most challenging in the world. 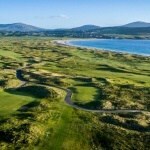 A ferry service also from Buncranna opens up the rest of County Donegal where again you won’t have to travel far to find a golf course to suit your needs. Ballyliffin Townhouse is an exceptional hotel that is sure to accommodate your every need during your golf vacation to Ireland. If you would like to stay at Ballyliffin Townhouse as part of your customized Golf Trip to Ireland, please contact us on Ph:+353 (0)91 868642 or Email: sales@northandwestcoastlinks.com . Check out some of our sample packages here.